A core belief in Jewish theology is the conviction that the "Mashiach", the Messiah, will come to redeem the Jewish people. Exactly who and what the Jewish messiah is has been a matter of much controversy and disagreement among Jews for as long as normative Judaism has existed. Yet the belief that a figure will arise and bring peace to the world and will bring all Jews to the Land of Israel to live with the rebuilt Third Temple is universally accepted among religious Jews. Hassidic Jews have, traditionally, studied the teachings about the Messianic Era closely, and developed their own beliefs - one Hassidic belief states that in every generation a potential Messiah exists, and whether he is able to come forth is dependent on the deeds and actions of the Jews of his generation - if enough prayer and good deeds take place, the revelation of the Messiah will take place. This is a compelling and attractive concept, and has, in recent years, been accepted outside the Hassidic world as well. The last Rebbe, leader, of the Chabad Hassidic community, Rebbe Menachem Schneerson, pushed his followers in this direction. He directed his followers to devote their energies towards outreach. Today, Chabad emissaries are in the forefront of the Jewish outreach movement. Towards the end of Rebbe Schneerson's life, many of his followers began to believe that perhaps Rebbe Schneerson WAS the Messiah about which he spoke constantly. The Rebbe-is-the-Mashiach movement grew in strength, with the highest percentage of followers (not all Chabad Hassidim concurred) being the Israeli Chabad community. The pinnacle of this movement is in Tzfat, and in recent years, the movement has actually gathered strength. 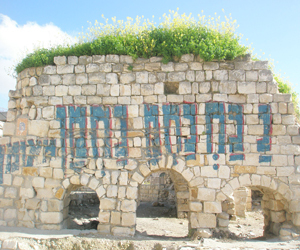 Since the Chabad community is one of Tzfat's largest, Tzfat has developed a reputation as being the "headquarters" of the "Messiastics". Public events always feature Chabad activists urging Jews, especially non-religious Jews, towards greater religious observance. They sing and dance in the streets, engage people in street discussions, and generally create a climate that may bring the "Massiach." Another noticeable Hassidic group which believes that they can bring the Messiah is the Breslev Hassidim. Breslev is also an outreach-oriented Hassidic group. The Breslev Hassidim teach that the Messiah will come when the Jewish people are infused with joy and will worship God with their whole beings. In recent years, the Breslev community has expanded noticeably in Tzfat. Also noticeable is their street theatre - they are prone to setting up a table, booth, or simply opening the back doors of their vans and turning on loudspeakers which play their signature tune......"Na Nach Nachman M'Uman" (a salute to their founder and leader, the 19th century Rebbe Nachman from the Ukrainian town of Uman). They then begin to dance and jig, believing that this will bring joy to the people watching them. The locals barely give them a glance, but the tourists are entranced. The Kabbalistic Book of Zohar teaches that the Messiah will come from the tomb of Rabbi Shimon Bar Yochi, the 1st century A.D. Kabbalistic teacher, at Mt. Meron. According to the Zohar, the Messiah will travel from Mt. Meron through Tzfat on his way to Jerusalem, where he will inaugurate the Messianic Era. The activities in Tzfat, whether accurate or not, will certainly make the Messiah feel quite comfortable on his travels.